Safe, Ecofriendly, Non-Toxic Fabric Washing Liquid. Did you know that traditional laundry detergents use several toxic and harmful ingredients such as sulfates, ammonia, phenols, phosphates and even known carcinogens like dioxane? You run the risk of being affected by these harmful chemicals by either inhaling fumes or by slowly absorbing these ingredients through your skin, from residues left behind on your clothes. The quality of ocean, plant and marine life are also adversely affected by the millions of liters of laundry detergents released into sewage, every single day. Safe: Ecowash is safe on your clothes, for you and for the planet. Ecowash was carefully formulated without using over 20,000 commonly used harmful, polluting and toxic chemicals as classified by the EWG or the Environmental Work Group. Non-Deceptive: Traditional laundry detergents smell of lavender, lilies and other inviting fresh scents. But, did you know that these scents are often added to mask the pungent odors of harsh chemical agents. Ecowash is unscented as there’s nothing to hide. It naturally has a mild and calming citric fragrance to it. Environmentally-Friendly: With Ecowash, you will no longer pollute the planet’s waters when your washer runs its rinse cycles, draining away thousands of detergent polluted water. Millions of plant and aquatic life stand to benefit from this change. Use 30 to 60 ml for every 5 Kgs of Fabric. To remove tough stains, apply Ecowash directly upon stains, lightly agitating stained areas with a brush, before loading them into the washer. Increase washing time, water temperatures or both to increase wash performance. Ingredients: Sucrose ester of dicarboxylate, succinic acid ester, organic suphonates, pH buffering agent. 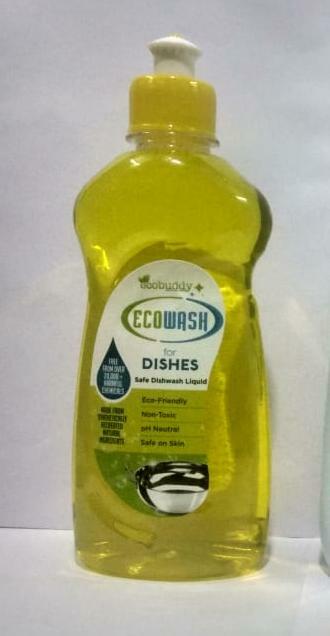 Ecowash is a synthetically formulated, non-toxic, non-polluting and family safe fabric wash solution.